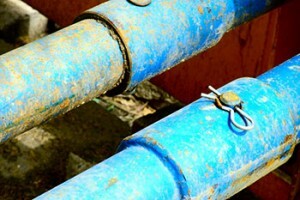 Is your sewer line backed up? Look for these four signs. Sewer lines are fantastic when they are working properly, as they take care of waste water from your washing machine, your sink faucet, your shower, your toilet, and everything else in your home. So, when your sewer line is backed up it isn’t a good sign. Here are four signs that your sewer line is backed up and that you should call the plumber ASAP! It isn’t uncommon for one drain in a home to be clogged, but having more than one drain clogged isn’t normal. This is often a sign that something is backed up in your sewer line. This is an especially worrisome sign if the drain that is clogged is not typically used very frequently, like a guest bathroom drain or garage drain. When using your plumbing normally, water backing up in drains that you aren’t using is a sure sign of a sewer line problem. Do you hear gurgling in the tub when you flush the toilet? The water is being blocked by a clog in your sewer system, so it is trying to get out wherever it can. Bubbles occur when water attempts to pass a clog in your sewer line, so tons of bubbles whenever you flush your toilet or drain the sink are not a very good sign. To troubleshoot the clog, fill your sink with water and your tub with water and look for bubbles as they drain. The biggest sign of a sewer line backup is often problems with the toilet. If your toilet isn’t flushing easily and plunging isn’t making a difference, it’s a sure sign that there’s a major sewer line problem instead of a simple thing plunging can fix. Call Master Plumbing immediately to avoid future problems. Give Master Plumbing a call at (301) 650-9100 or contact us online to get more information on how our expert plumbers can help you with your sewer line backup (or just about anything else plumbing related!). We have received Angie’s List Super Service Award recognition for plumbing and drain cleaning every year since 2007, in addition to the Best Plumber award from Best of Bethesda. We are fully licensed, bonded, and insured and our service is unparalleled. Give us a call today—you won’t regret it! To see examples of our projects, follow us on Facebook, Twitter, and Pinterest. This entry was posted on Friday, March 31st, 2017 at 6:22 pm. Both comments and pings are currently closed.